Facts: Client was driving a commercial vehicle when he was pulled over for traveling 81 mph in a 55 mph zone. Officer gave client a citation for speeding. Facts: Client was pulled over for traveling 70 mph in a 55 mph zone. After officer pulled client over, client admitted that he was unaware of his speed because he was heavily distracted by the car behind him that was driving very aggressively. Client was written a citation for speeding. Result: Case REDUCED to regular speeding upon Motion filed by Kreps Law Firm Traffic Attorney and payment of court costs. Facts: Client accelerated to 87 mph in a 55 mph zone to pass a drifting vehicle. Result: Alabama Speeding ticket DISMISSED upon completion of Driving School and payment of court costs of $138.00 as negotiated by Kreps Law Firm Traffic Defense Attorney and prosecutor. Client did not appear in court. Facts: Client was pulled over for going 65 mph in a 45 mph zone. Result: Alabama Speeding ticket DISMISSED upon completion of Defensive Driving School and payment of court costs of $116.00 as negotiated by Kreps Law Firm Traffic Defense Attorney and prosecutor. 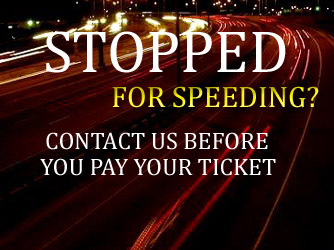 Facts: Client was ticketed going 85 mph in a 55 mph zone. Result: Charge REDUCED to regular speeding 70 mph in 55 mph zone and payment of court costs of $150.00 per negotiations by Kreps Law Firm Traffic Defense Attorney and prosecutor. Client did not appear in court. Facts: Client was ticketed going 75 mph in a 50 mph zone. Result: Charge REDUCED to regular speeding 55 mph in a 50 mph zone and payment of court costs of $123.00 as negotiated by Kreps Law Firm Traffic Defense Attorney.